Nothing says summer like a popsicle on a hot sunny day, preferably sitting on a deck listening to the waves roll in. 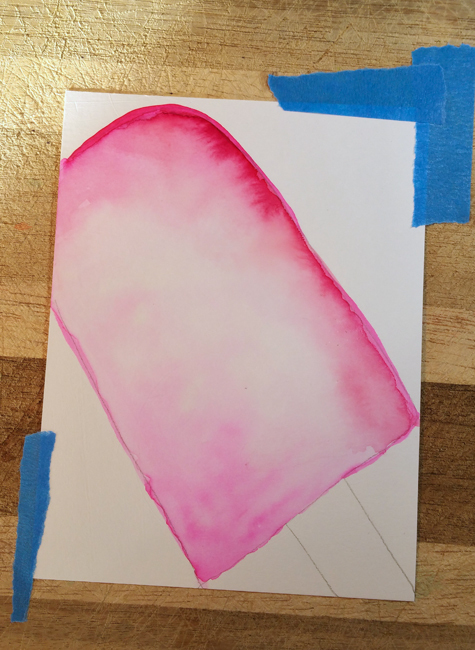 Since I'm not eating sugar, or artifical sweeteners right now, or listening to the waves roll in, thought I'd indulge by making a popsicle card! watercolor paints (I used Tombow Markers and Peerless watercolors). I need some watercolors other than these as I have limited colors and I find the Peerless and the Tombow work best on smaller images. 1. 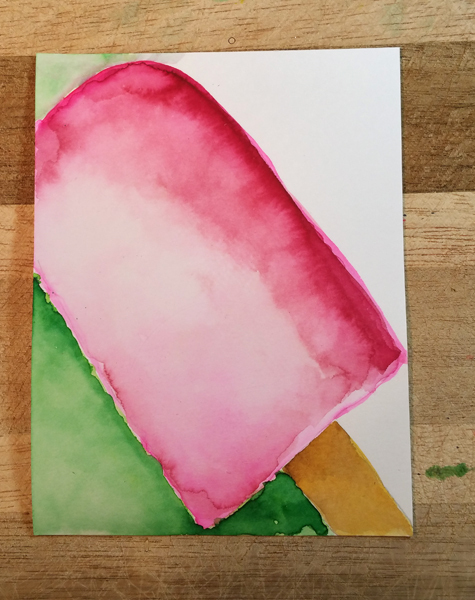 Cut watercolor paper and draw popsicle. 2. Color in the popsicle. I start at the outline and move in. Once the outline is painted, erase pencil lines. The more water you use, the harder the lines will be. 3. After you paint an initial layer of the popsicle itself, let dry. 4. Work on the background. 5. Add ink (I used a pink marker) on craft sheet and add a little Mod Podge Dimensional Magic (about a nickle size) and mix. 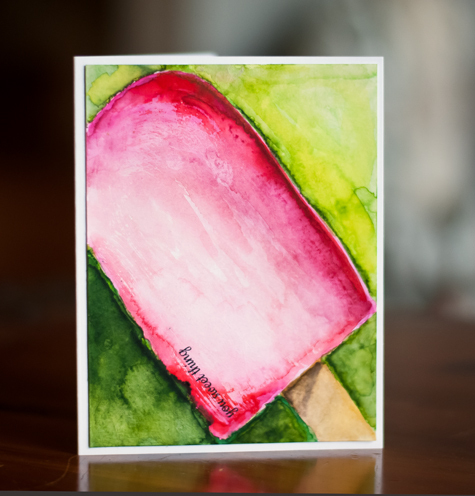 Paint that mixture on parts of the popsicle with a flat brush to add some texture and to act as a bit of a resist. 6. Let dry. Because it's a thin mixture, the Dimensional Magic will dry while you get up and wash that brush. You want to wash the paint brush right away or the Dimensional Magic will harden on the brush. 8. After it dries, hold your breath and stamp the sentiment if you want one. 9. Adhere dry panel to card. 10. Mail the card to someone sweet. Here's a few pics in progress that I took with my cell. Started to fill in the background. See the shiny part? That's the initial layer of the Mod Podge Magic Dimensional. Thanks to all of you who took the time to comment here on the blog (and on Facebook and Instagram) on my last set of cards. I appreciate the encouragement! MOOD WHEN DONE = Summery! You make it look so easy Joan! Wow this looks amazing. What a great look. Thabus so much for stopping by my blog and leaving some comment love. Yummmm!!! I like that you added in the process steps. Always enjoy the process of creativity. P.S. Popsicle molds are easy to find this time of year. Making your own would be easy and they truly would be "no added artificial colors, additives or sweetners"
I'm drooling, that looks so yummy! Looks cool and refreshing, Joan--beautiful job! I love that you are experimenting! Again, your watercolor art is amazing! I would buy cards like this. Seriously. There's something irresistible about it. 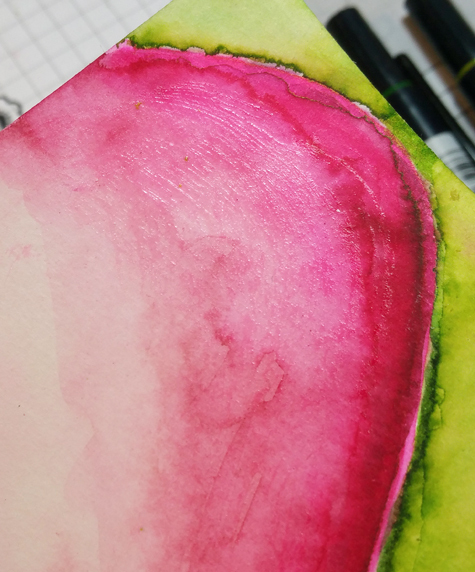 All your watercolor fruits are a fantastic collection!